If you want to jump in ecommerce application you need to focus its architecture and design adaptively of application. Ecommerce application always categories in two parts native app and hybrid app. Hybrid App – In Hybrid app development always become very challenging task for developer due to less community, less documentation and less reusable component. Only few hybrid framework provide rich documentation and tool. Few framework I also mention below. Native app-This point state that application based on particular operating system like Android, iOS and Windows. Every platform has a separate user and separate download store. Android application can be access from Google play store and iOS app can be access from iTunes play store. Less accessibility due to low design and less component. 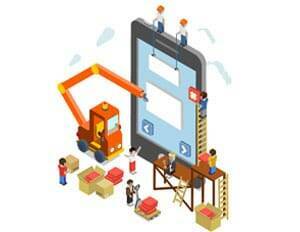 A compelling mobile application must feature an interface that focuses on usability. It’s always recommended to follow the general applications that will help users to use the application like Facebook, Instagram, and Twitter. You should always have a simple and uncluttered layouts that can help the users to navigate properly and should be easier for the user to find the application globally. Feedback plays a vital role in decision making of users. It is important for us to give opportunities to users to give feedback to the applications they use, as it will not only help us to understand the problems user is facing while using the application but also giving us the opportunity to improve the application. The important part is that you give your users a quick way to report bugs, and provide suggestions or criticisms. Users will appreciate knowing that you are open to their feedback and that their input can shape the future of your app. Users feel great if they can personalize their settings, pages and choices. We need to make sure that we are giving options of setting to our users where they can have the opportunities to make changes & modifications as per their requirements. Ensure the application you are using has clear cut and specific information that can help the use to give optimum solution of his need and should not be bombarded by many options that might confuse the user in his/he decision making. We should always remember that its a phone where user have limited access to the information, important is how we present it. The content should be relevant and should have all relevant information of what user is searching. Ensure there should not be any irrelevant information that make users confuse or deviate from what he is searching for. If our users want to register, sign up, or fill out forms, be zealous about eliminating every possible click, or tap, from the design. It is important to ask for minimum information, as its been notices that conversation rates fall shortly if they have to fill high information or to select many options, also when it comes to personal or any specific information then there is a possibility that user will not feel comfortable to share it, hence it is critical to eliminate unwanted or access clicks. The application should be easy to access, always allow them to select their user name and password, also give them access to retrieve their information by other ways, like Facebook, Gmail etc. Now a days it is difficult to remember passwords of each and every logins and if the application can be accessed by using Facebook, Gail, Twitter or any other social applications. Application should be socially integrated. Should work on Social Login. Should allow user to connect with his/her account. Social Information should be tractable. For a mobile app developer, one key component is to incorporate analytics into your mobile app. It should be easier for small business to track and identify their users experience and actions. You should also understand that most of the users do not want to give personal information on applications like their birthday, location income etc. Being an app developer you should also understand that data gathering is equally important as it may help you to understand your users and to modify the app accordingly. Tracking Application using Google analytics or other third party like Facebook etc. The application should be such that can work week of without internet connections as well. It is very frustrating that if you have a weak connection and you cannot open or access the applications, no we need to ensure that the application should work on weak signals as well. Cache and static pages could help to keep data offline. Cache mechanism are frequently used these days in other application Like Twitter and Gmail. So provide some relative data to user even if there is no network or less newtork. Gamification helps users to be more interactive and can have fun while using the app. User will come back again if they have some personalize and interactive things to go, like gaming, wish list or some small coupons. Gamification is play very crucial role for your application, It engage user with product as well as application so give more option that user can save, edit ,reply, give feedback whenever he/she wants. It’s very important to ensure that your application is not slow, instead it should be quite and user friends. Users easily get frustrated to the application that gives slow response or takes a lot of time to open, hence application should be fast and user friendly. Every application known by its performance and design so when you plan to develop commerce app please ensure that small amount of code and less images should add with application. Always try to add png images for e commerce application because we know that graphical thing makes app heavy and bigger in size. Please ensure that you should use custom api provided by platform and use third party library to improve permanence, Add light weight component to app to make faster. The Search feature in any application helps the user to select the things according to his requirement and specifications. It is very important to have search feature in any application that allows users to search their requirements. Brand – User may search items based on his/her brands like Adidas, Puma etc. Category- User can search items based on his/her category and also provide there sub categories .Example of category like Men, Women, Kids, Home Appliances and Mobile etc. .
Advance Search-This helps the user to search by multiple options and categorization. Keyword- This helps the users to search the product by relative key word. Checkout process is an important part of application we need to maintain balance between good functionality, usability and trust building key that offers a good checkout experience. It is been observed that a poor checkout process leads to losing of 67% of customers. We need to make sure that the checkout process should be easy and should give confidence to the users to make payment. Payment mode should be safe and user friendly so target only good payment provider. The Mobile app personalization is the process of creating the application in such a way that the user can get the data according to his or her choice based on his/her recommendation, choices and preferences. Through personalization, the app helps the user to save any kind of research themselves that also creates a more frictionless purchasing experience. Recommendation engine always helpful to provide data on behalf of his/her best interest and that also helpful to track user interest and likes. Here mention some top recommendation engine which is very popular in these days.